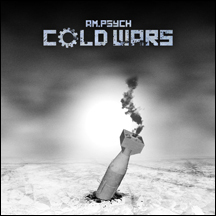 7 years in the making, Cold Wars is the long awaited debut album from Milwaukee's am.psych. A pioneer of the Midwest coldwave revival from a few years back, am.psych blends crunchy guitars, harsh sounds and angst filled lyrics with smooth synths and a little EBM. The wait was well worth it, as am.psych delivers a more mature album, with a heavy influence placed on the melodic sound structure of each track. Cold Wars has a little something for everyone. Standout tracks include: Cramp, Luminescent and Temptation.